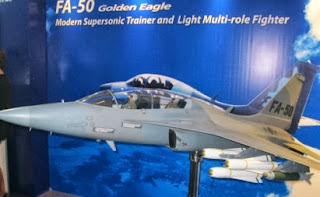 A model of the FA50 jet fighter of South Korea is seen in the 2012 Air Power symposium. Philippines still keen on South Korean fighter jets but held while waiting for the result of investigations for the cause of the 2 incidents. The Philippine Air Force (PAF) is closely following developments in the crash investigation of the T-50B lead-in jet fighter that killed two pilots recently, in light of earlier plans to work out with the same manufacturer the purchase of a dozen FA50 jet fighters with the same platform. The aircraft is billed in one article that reported the crash as "South Korea's first indigenous supersonic aircraft jointly developed by Korea Aerospace Industries (KAI) and Lockheed Martin." The government is pushing through with its plan to acquire 12 FA-50 fighter jets pending a probe on a recent crash involving a similar aircraft, which killed two South Korean pilots, the defense department said. "(The process of) acquisition is still continuing. Until we get the outcome of that particular investigation (on the crash), the process is continuing at the moment," Peter Galvez, spokesman for the defense department, told reporters yesterday. When asked if the mishap could jeopardize the plan to acquire the jets from South Korea, Galvez said: "I believe all factors will be considered." A representative from KAI met some officials of the Department of National Defense last Friday, sources said. Meanwhile, PAF spokesman Col. Miguel Ernesto Okol said the command had learned that the Air Force of the Republic of Korea (ROK) was also doing a parallel probe. KAI is reportedly attributing the crash to "pilot error". Okol said the latest crash "is still under investigation of the ROKAF (Republic of Korea Air Force)." On PAF's plan to acquire the FA50, Okol said this is among the issues to be "taken up with the manufacturer" and that officials will make sure "that all issues [are] resolved should we proceed with the planned acquisition." Indonesia reportedly ordered 16 T-50s in 2011; and that Seoul is also pursuing a contract from Iraq. Meanwhile, the DND has not indicated if President Benigno Aquino III will approve the contract to acquire the FA50, for which ₱18.9 billion is being set aside for 12 units. The money will be sourced from the ₱75 billion approved by President Aquino for the upgrade of the Armed Forces' capability for territorial defense. Certain defense and military experts had earlier doubted if the FA50 is the best option for PAF in terms of territorial defense. It will be recalled that in his 4th State of the Nation Address (SONA) in July, Mr. Aquino criticized the decision of military officials to acquire, for ₱2.8-billion, eight brand-new Sokol combat utility helicopters from Poland's PZL Swidnik. Such aircraft, said Mr. Aquino, are not really fitted as combat helicopters. The government plans to acquire 12 FA-50 jets for ₱18.9 Billion from South Korea to boost the Air Force's territorial defense capabilities. The government is expected to start talks with supplier Korea Aerospace Industries soon. Concerns on the viability of the FA-50 have been raised after a similar jet trainer crashed near Gwangju, South Korea on Aug. 28. It was the second crash involving a T-50 jet in less than a year. In November 2012, a T-50 crashed "into a mountain…killing a pilot,"
The FA-50, the model of the jets that the Philippines is planning to acquire, is a variant of the T-50. The defense department's Bids and Awards Committee had approved the terms of reference for the acquisition of the jets. If everything goes as planned, at least 2 would be delivered before the end of the year and the full delivery of the remaining jets would be completed before the Aquino administration steps down in 2016.